Forget the Red Carpet – the most important event during the first day of Montclair Film Festival is the second anniversary of Java Love, Upper Montclair’s First Coffee Shop, on Bellevue Ave. The second location for Catskills based Java Love Coffee Roasting Company, the shop actually has its roots in Montclair. Owners Jodie Dawson and Kristine Petrik reside in town and are active supporters of many local activities including the schools, numerous charities, and Taste of Montclair. Java Love was born out of a search for a really good cup of coffee. Like so many of the great entrepreneur stories this one has the same “We couldn’t find it so we made it ourselves” conclusion. Of course the end of that story was just the beginning of the story for us. The Northern New Jersey food community is slowly becoming a leading region for the locavore movement. We’re finally living up to the Garden State nickname and want our food to come from local farms, or at the very least be able to trace the food back to its source. Restaurants like Terre a Terre in Carlstadt, Laboratorio in Montclair Center, Dough Artisan Pizzeria in Caldwell, and Escape in Montclair, can trace most of what they serve right back to the original farm. Since coffee comes from the tropics, it’s a wee bit challenging for Jodie and Kristine to pop in on the farmers but that does not stop them from serving a product whose journey from farm to cup is shorter than most of what’s on the market. Coffee beans have flavor profiles that change based on region, season, and even other crops or native vegetation in the area. When coffee brokers bring their beans to Bethel, careful selections can be made of a little more of this variety, a little less of that one, while passing on the other one, all with the goal of producing the perfect blend. It’s about as close to homemade as anyone is going to find anywhere. Describing the flavors of these small batch roasted coffees is a challenge. So let’s put it this way, you know how no matter times the prepared food in the grocery store claims to be “homemade” and its good, but not as good as Mom’s? That’s exactly what’s going on here. You just have to have a cuppa to understand why locally roasted, recently roasted coffee is better than everything else on the block. The commitment to excellence is about more than just flavor. The great customer service experience does not end with the patrons who come into the shop, it continues other direction as well with respect for the environment and the farmers who grow the coffee. 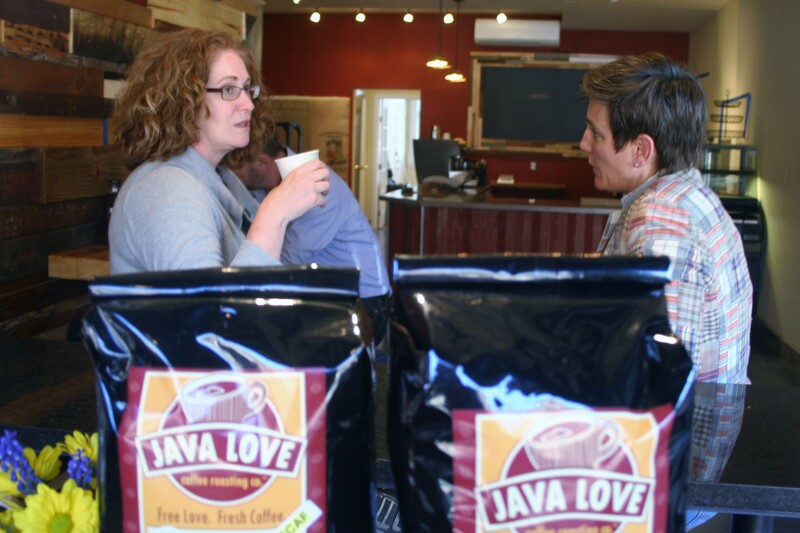 Java Love Coffee Roasting Co uses only the very best Organic, Fair Trade , Naturally Farmed and Rainforest Alliance coffee beans . They also use compostable service items which reduce waste. Even the used coffee grounds are made available for local gardeners. Coffee grounds, when scattered around roses and broad leaf evergreens like Azalea, produce great results without all that chemistry of store bought garden supplements. No doubt there is going to be a Black Tie and Flip Flops field trip in the coming weeks to Upstate NY. The Catskills are gorgeous and are home to the original Java Love Roasting Co. We can’t wait to see the Dietrich micro-batch roaster in action, smell the roasting beans, and see where it all began. 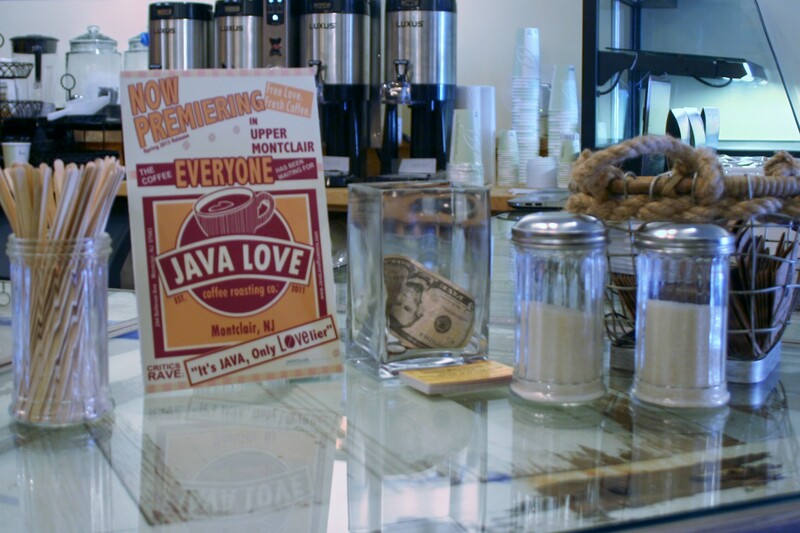 JavaLove is in Upper Montclair NJ – right next to Olive That and More, and near the Bellevue Theatre.